Looking for one of the sharpest trucks on the market made by General Motors? Well here you have it! 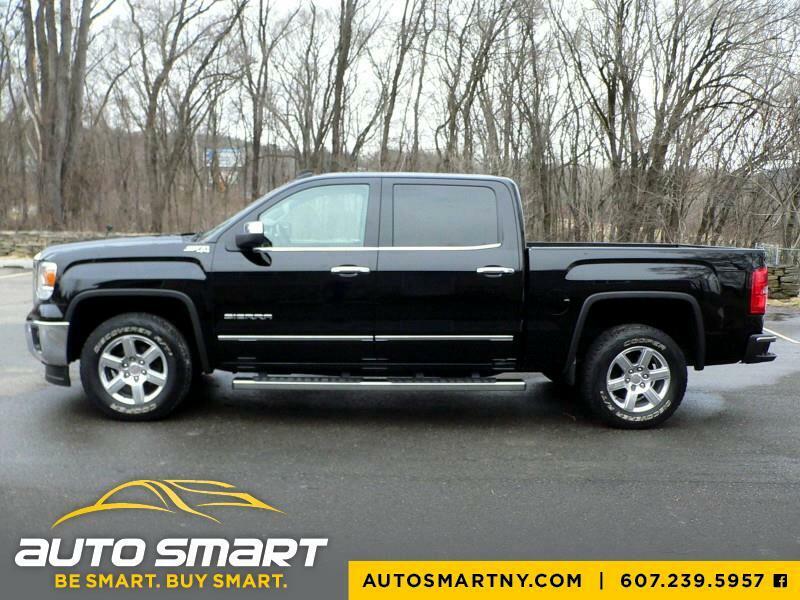 Check out this 2014 GMC Sierra 1500 SLT with only 92,400 one owner miles! Gloss black with a black leather interior and fully stuffed up with dual power heated leather seats, premium sound with full media display and GM app suite, factory tow group with integrated brake controller, rear camera with park assist, rear cargo lighting, premium running boards, premium chrome wheels, exterior chrome accents, factory bed liner and so much more! Professionally detailed inside and out! 100% non-smoker! Newer brakes and rotors all the way around and very nice tires! This is just one nice truck and once you drive it you will simply fall in love! Read what others say about us on Facebook and take the trip to see us so you can win in a big way! "Be Smart -N- Buy Smart" at Auto Smart, LLC! There is a reason so many people act upon our “Be Smart Buy Smart” slogan! It’s simple, we sell some of the nicest vehicles at some of the best prices and we back all vehicles sold with our personal guarantee; no questions asked! We have on the spot financing options for everyone regardless of your credit history and we offer incredible extended warranty products that provide near bumper to bumper protection for as little as $30/month! Save in a big way and call us today at 607-239-5957 or simply stop by for a test drive to get a real feel and let’s make an Auto Smart deal; you’ll be glad you did! Every vehicle sold at Auto Smart comes with a standard NYS Lemon Law Warranty! We also sell phenomenal warranties for exceptional prices! Please inquire about our warranty products that will help protect your investment! Though we take considerable effort to make sure that all information online is correct there may be instances where some vehicle information and options are listed incorrectly on this website and on other third party websites. We are not responsible for vehicle omissions and errors in third party listings. We often find that third party listing services list information incorrectly. The vehicle price listed in the window at our dealership is the actual price of the vehicle. In the event of a pricing discrepancy between the vehicle price listed online vs. the vehicle price listed at our dealership, the price listed in the window will be the priced used. Because vehicles are driven on the lot daily there may be instances where there is a small discrepancy in the vehicle mileage online versus the mileage in the photos and at our dealership location. Please call prior to your visit to make sure the information is correct and that the vehicle is still available.